One of the delights of taking a trip like this alone is that I could follow any road sign that looked interesting. On the way to Quin I saw signs for Knappogue Castle. Now, how do you pass up a castle? Honestly. So, I began to follow the signs. Over hill and dale, literally, I drove on little country roads that were often barely one lane. Fortunately I rarely met other cars, and when I did, they or I scooted over off the road to allow the other to pass. At last I drove up the castle driveway. Frankly, it wasn’t much of a castle. But there was a nice gift shop where I bought a cheap umbrella as it had begun to rain. Then back into the car and down the road again. 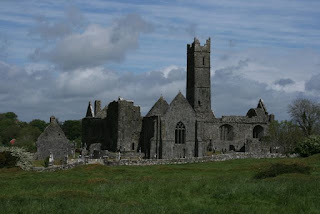 Finally I came upon the hamlet of Quin, and there in the center of town I found Quin Abbey. When I was 18 and in London I fell in love with a stone church that was bombed out in WWII. 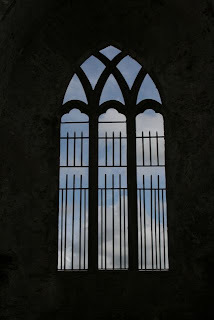 I’ve always wished that we’d gotten married there – in a church but outside at the same time. Frankly, Quin Abbey is even more beautiful! Built in the twelfth century, it looks like a small Westminster Abbey – but open to the sky. The roof is gone. The windows are gone. The entire building has been abandoned for nearly 200 years, and Nature has moved in. Grass grows in the dormitory. Pigeons roost in the sanctuary. An old man and his dog look after the place as people wander through. The graveyard has crept inside as people have buried their loved ones within the walls of the abandoned nave. 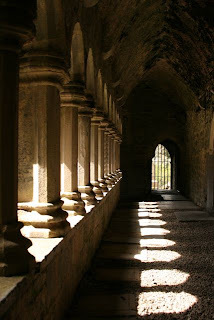 The spirits of monks long dead seem to linger in the cloister with its twisted stone columns and Gothic arches. The building is simplistic beauty: the body of a great cathedral without the embellishment of hundreds of years. Instead, she wears the green of Ireland in the grasses and daisies and dandelions of spring and the blue grey of a stormy sky. Through the window frames you see the rolling fields and ivy-covered stone walls. Beneath a tree graze three beautiful cows. It sounds romanticized, but it was poetic. Quin is a cute little village, and I ducked in to a pub for lunch during a rain shower. Then I got back into the car and continued on. I felt confident and ready to carry on. Now that I’d gotten this far, I had one goal: the Burren. 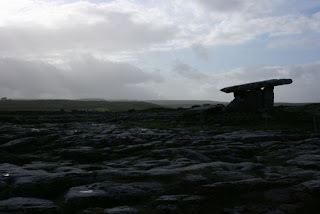 The Burren is a geological freak: an area where limestone buckled and heaved into a bizarre landscape of stone. R and I had seen something on the Discovery Channel about it, and I wanted to see it in person. On the way, though, signs for Dysert O’Dea distracted me. With a name like that how could I resist? Once again I was traipsing through the country, following signs and praying each time that I was taking the correct turns on the correct side of the road. Dysert O’Dea is a beautiful little medieval castle with a museum inside, but the bigger attraction for me was the falling down Romanesque church. The ground floor of the castle is now a little tearoom. I sat and enjoyed a cup of tea while eavesdropping on the proprietor and her friend chatting about their grandchildren. “Traveling alone, are ye?” she asked me as I ordered my tea. “Well, God bless ye! What a modern girl ye are!” This modern girl enjoyed her sugary tea and then bought a map of the Burren before heading out. The grounds of the castle – acres and acres – are full of Druid landmarks, medieval ruins, and a falling down church. I chose to hike out to the falling down church. The woman in the tearoom directed me to cross the little bridge and turn right. What she didn’t tell me was that I was headed through a field of cows! And there, in the midst of the cows, was the High Cross or St. Tola’s Cross. 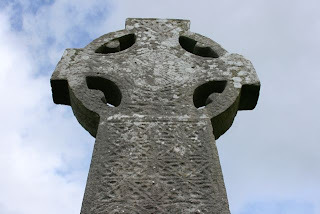 Medieval Irish churches often had what are called “directional crosses” on their grounds. These large stone crosses, often intricately carved, marked one or more of the compass directions. This one marked due east. They are actually a hold over from the Druidic and Celtic traditions of large stones marking specific directions (think Stonehenge). Now, they say happy cows come from California. They are wrong. Happy cows come from Ireland. As I traipsed across the field, the most beautiful cows I’d ever seen moseyed about – eating scrumptious grass and batting their long lashes at me. They munched emerald grass that looked delicious even to me and basked in the sunshine, admiring the twelve-foot tall cross in the middle of their field. I wandered through, taking photos. They didn’t pay much attention to me. The little church features a beautiful Romanesque doorway carved with faces all across the arch. And locals have used the abandoned grounds as a cemetery for centuries, so even the inside of the roofless chapel is filled with Celtic crosses. 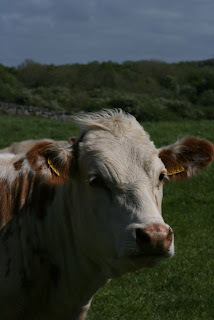 Bidding the cows adieu, I jumped back into the car and headed off again toward the Burren. My newly purchased and hand-drawn map, suggested a stop at the village of Kilfenora where another falling down church – this time an ancient cathedral beckoned. This cathedral still has five of what were probably six directional crosses in tact – one of which is standing in the middle of a sheep pasture. The sheep were even less interested in me than the cows were! 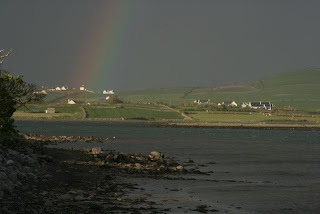 As I drove on deeper and deeper into the Burren the landscape changed dramatically. The Burren is a strange geological area scraped clean by glaciers and shaped by dramatic uplifting and folding of limestone beds. It is not farmable, nearly ungrazable, and full of fossils and ancient ruins. And by ancient I mean prehistoric. I pulled off the road to visit the Poulnabrone Portal Dolmen – a 5000-year-old burial site. The strange stone temple stands in the middle of a slick rock plane in a landscape that is almost otherworldly. No trees. Scrubby, mossy vegetation. And bare, rounded stone in all directions. Prehistoric residents seem to have regarded the area as spiritually significant as did the Celts and the early Christians. Leaving the Dolmen, the sun was beginning to set. I wanted to get to the coast before dark, so I sped along. And suddenly, there was the Atlantic. I drove north a bit along the coastline, stopping at the abandoned Colcomroe Abbey, and as the last rays of sunlight disappeared I turned onto the highway and headed south toward my hotel. A successful day of driving on the left!